2007 was filled with examples of the difference one can make in the community. They include a top chef and a baseball manager who made the city proud, an airline and a park system that are great for getaways, and an Arabian therapy horse and hospital system with high marks for healing. It was also a year when RTA was recognized as the number one transit authority in the country. Collectively, these national honors elevated the region. They helped to erase seasons of fumbles and failed drives, lake effect snowstorms and burning rivers, and monologues of bad jokes. There are a number of reasons to live and work in Northeast Ohio. Among them are great cultural institutions, beautiful neighborhoods, and an assortment of top-rated colleges and universities. Add to this list the best transit system for the best location in the nation. In 2007, RTA was recognized as the best transit system in North America. It's a title we've sought for a number of years, and one we're proud to share with the community. And like any worthy distinction, it required dedication and hard work, along with a singular focus-to provide outstanding, cost-effective public transportation to the residents of Northeast Ohio. Posting a winning record against the competition was the first reason for our number one ranking. RTA has achieved steady ridership growth over the past several years. This winning streak continued in 2007, with more than 57.3 million rides provided for a fifth year of gains. The ridership increases were not simply the result of higher gas prices. RTA campaigned hard for drivers to Join the Ride. On the airways and highways, Internet and Inner Belt, commuters were questioned if they would really miss speed cameras, road construction, and everything else associated with driving. The advertising messages were backed by a No Drive Day Rally and a free trial ride offer, making it even easier for drivers to take a pass on the pump. Commuters who made the switch discovered it really is greener on buses and trains. For a second year in a row, customer satisfaction was up by double digits, increasing by more than 10 percent. RTA operators and mechanics deserve much of the credit. Through the TEAM incentive program, they made getting riders to their destinations safely and on-time a priority. Ironically, their efforts were recognized by an auto dealership, as RTA was a recipient of the 2007 Metro Lexus World-Class Customer Service Award. RTA was also a greener choice for the region. The combination of fewer cars on the road and the transformation of RTA buses to clean diesel has contributed to a lowering of CO2 emissions in Northeast Ohio. In addition, more and more Clevelanders decided to combine cycling with riding, as the number of bikes on trains and buses grew. Another reason RTA was recognized as the best transit in all the land was a strong understanding of transit needs close to home. The Trolleys have proven to be the right ingredient in revitalizing downtown, connecting office workers, residents and visitors to restaurants, hotels and entertainment venues. In addition to changing the way people travel the city streets, they have altered mindsets about our town - that stepping out for lunch with friends is okay and bowling after work can be fun. This kind of thinking has grown, and today the Trolleys carry more than 3,500 passengers per day. But it's not just our downtown that's getting a second look. Residents are rediscovering their neighborhoods onboard RTA's Community Circulators. The 12 routes make frequent stops at libraries, drug stores and local shops. And unlike the family SUV, these buses are an economical choice for completing daily errands. In 2007, Dave's Market made the Community Circulators even more attractive with free 2-Trip Farecards on grocery purchases of $15 or more. Area residents are also boarding the Community Circulators as a result of RTA's introduction of ONE PASS TRIPS. The travel guides capture the flavor of some of Cleveland's culturally distinctive neighborhoods. They provide would-be tourists a recommended itinerary, complete with route maps and best-kept secrets on where to dine - so now it's easy to find the richest cannoli in Little Italy and the most eclectic coffee house in Tremont. Paratransit, a vital link for thousands with disabilities, is probably the finest example of RTA's understanding of the community it serves. Last year, functional testing was initiated in an effort to maintain the highest quality of service to those most in need. This policy change follows a $1.4 million investment in advanced scheduling software and other upgrades that have given Paratransit users greater comfort and confidence. Forward thinking was a category in which RTA received high marks in judging it to be the best. A vision of a better way to move people from place to place and the community forward was top on the list. And in 2007, this vision became much closer to reality, as significant milestones were achieved on the Euclid Corridor project. At year's end, construction was completed on Public Square and from East 17th Street to East 55th Street. Significant progress was also made from Public Square to East 9th Street, and from East 55th Street to East 86th Street. The most visible signs of things to come were provided by the installation of median and curbside stations. The vehicle that will power the line was also on display-outside Jacobs Field, and at Ingenuity and Winterfest - giving the public a look at the concept vehicle soon to be rolling down Euclid Avenue. Investments to improve travel occurred in other areas of the transit system as well. The new $4.7 million W 117th St./Madison Avenue Highland Square Station opened to riders of the Red Line, the lot expansion was completed on the North Olmsted Park-N-Ride, and 45 clean-air buses were added to the RTA fleet. Safety remained a top priority, and smart technology was used to enhance RTA's protection of riders. This includes cameras installed at stations and aboard buses, and computers retrofitted into Transit Police vehicles. Smart dogs were also on the job, patrolling passenger facilites for potential threats. And students became smart about safety through a new RTA safety video displayed during visits to area schools. As happens with any championship season, there's been plenty of banter on what play made all the difference. We're more focused with the results, and the fact that the words "wait until next year" will not be uttered by diehard Cleveland commuters anymore. Consistency defines Cleveland Indians Manager Eric Wedge. This is why his game plan in April is the same as in October, allowing his players to perform to a rhythm as steady as John Adams' drum beat. In 2007, Wedge relied on his even-keel personality to overcome pitching changes and mid-season batting slumps, leading his team to 96 regular season victories and an American League Central Division title. The solid numbers posted by the team earned Eric Wedge his own title as American League Manager of the Year. With an on-time rating that is among the best in the industry, RTA knows a thing or two about consistency as well. This focus caused more commuters to be fans of the transit system, with steady ridership gains. And it's one of the reasons why RTA was named Best Public Transportation System in North America from the American Public Transportation Association (APTA). 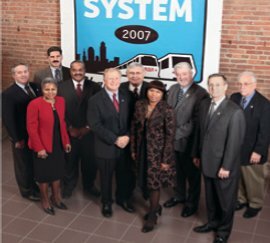 In 2007, Cleveland's transit system lived up to its championship title. It continued to make changes for improving the rider experience - updating its fleet, improving on-time performance, reducing operating costs to minimize fare increases, and offering downtowners a free service on the Trolley. RTA also rolled out a multi-media advertising campaign - complete with a made-up holiday - to spread the good word. The campaign's messaging appeared when and where people were thinking about (and hating) driving - like a turn on I-90 so treacherous it's called Dead Man's Curve. Or behind one of RTA's own busses. Or driving to work listening to radio that your car doesn't want you to hear. Then on June 22, RTA kicked off Join the Ride Day with a rally featuring Mayor Frank Jackson. As a result, the entire campaign caused a spike in ridership to 100,000 over the prior year. In fact, RTA's ridership has been growing for five consecutive years. The numbers climbed from 52 million to more than 57 million riders by the end of 2007. A significant contributor to those numbers was rail service, which grew nearly 9 percent - thanks in part to Cleveland's die-hard sports fans. Masses of blue and red clad enthusiasts traveling to and from home games (especially Indians Playoff games) results in a mess of traffic, so RTA offered extra rail service before and after all home games. In addition, service was guaranteed up to 90 minutes after the game's conclusion - even for Game 2 that went into 11 innings. The numbers are important, but not as important as what's behind those numbers. Every new number is another person who has realized the savings, the value of traveling with RTA. Every new number is another person helped. That's why RTA celebrates its numbers and its number one spot in all of North America. o clinch the title of America's Next Iron Chef, Michael Symon had to be able to perform under pressure. Fortunately for this chef and owner of two popular Cleveland restaurants, he's got plenty of experience bobbing and weaving through crowded kitchens. In Kitchen Stadium this past November, Symon prepared five dishes in just 60 minutes for his judges, each showcasing his creativity and knack for pairing the freshest and most innovative ingredients with the solitary "secret ingredient" revealed during the challenge. The Downtown Trolleys are just one example of RTA's similar knack for offering the freshest and most innovative services to the Greater Cleveland area. Launched in 2006 - incidentally, the same year Symon reopened Lola in Cleveland's downtown Entertainment District - the B- and E-Line Trolleys were RTA's answer to an aging loop bus system. Now, averaging more than 3,500 passengers per day, nearly five times the ridership of the old loop bus system, it's clear that residents and business professionals alike have embraced the cross-town connection that the Trolleys offer. As many city dwellers have come to know, all it takes is a smile to ride free on the Trolleys. But low fares and 10-minute frequency aren't the only things that have riders smiling. Across the system, safety measures, performance, and reliability have all been enhanced. In 2007, with the help of a newer fleet, streamlined maintenance facilities, and technology upgrades such as vehicle GPS tracking, RTA's operators and mechanics worked hard to keep service running on-time and free of disruptions. In recent years, each of RTA's employees has made customer service a priority. Fueled by the TEAM incentive program, customer satisfaction achieved double-digit growth in 2007, a big reason why RTA won the Lexus "World-Class Customer Service Award" in June. And yet RTA recognizes that world-class customer service cannot be achieved without a heightened commitment to technology. 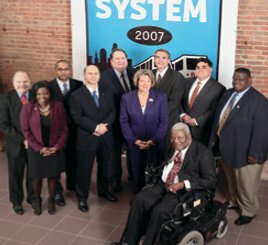 This is why, in 2007, RTA kicked off the New Year by installing state-of-the-art camera systems in vehicles and stations, and by retrofitting all Transit Police vehicles with computers. 2007 also marked the first year of service for the three K-9 members of the RTA Transit Police team. RTA works day and night to better serve its community. And, averaging a 90-hour work week, Cleveland's resident celebrity chef is just about the only guy in town who can keep pace. In the years to come, as Michael Symon continues to turn heads with his many inventive uses of the secret ingredients laid before him, RTA will continue to make headlines with its not-so-secret commitment to excellence. What's in it for us Clevelanders? Two things for sure... a great meal and a smooth ride. The Cleveland Metroparks are the best busy-city getaway with 16 reservations offering hiking and biking trails, beaches, sledding hills and more. It's no surprise the Metroparks received the 2007 National Gold Medal Award for Excellence in Park and Recreation Management from The American Academy for Park Recreation Administration in partnership with the National Recreation and Park Association. This is the third time for the park system in 15 years (winners can't be considered again for five years). RTA also provides its own form of escape. With its network of conveniently located Park-N-Rides in Euclid, North Olmsted, Strongsville and Westlake, as well as 12 Community Circulators, 52 rail stations, and 8,500 parking spaces around the Cleveland area, the transit system is a sanctuary from high gas prices and the hassles of driving. Green thinking is another thing RTA has in common with the Metroparks. Over the past five years, its entire bus fleet has been transformed to be environmentally-friendly through the purchase of natural gas and clean diesel vehicles. In addition, RTA was the first transit authority in the Midwest to switch to ultra low sulfur diesel, and to install after-treatment filters for removing more than 90 percent of all particulate matter from the exhaust. The bus fleet is also bike-rack equipped. And in 2007, 50,000 cyclists took their bikes on RTA buses and trains. RTA's efforts to clean the air in Northeast Ohio resulted in measurable success. The EPA found that the region's Ground-Level Ozone Emissions had dropped significantly. In 2003, emissions measured 103 parts per billion (PPB). But by 2007, they dropped to 89 PPB. The reduced count directly correlates with RTA's clean-air fleet transition. The infusion of 45 new clean-air buses in 2007, along with the expected benefits of hybrid vehicles on the Euclid Corridor line, should continue to reduce emissions toward the EPA standard of 80 PPB. Facility improvements by RTA last year helped to green-up the Cleveland area landscape. Most noteworthy is the re-opening of the newest Red Line Rapid station-Highland Park at West 117th Street. This $4.7 million project extended the network of new rider facilities, and features a heated waiting area, energy-efficient LED lighting, and canopies to shield riders from the elements between the station and parking lot. The long-awaited expansion of the North Olmsted Park-N-Ride was also completed, and because of the Inner Belt Project, much of the cost of this expansion was covered by the Ohio Department of Transportation. Like the Metroparks, RTA is cultivating its infrastructure. And as more and more Clevelanders Join the Ride, bus stops and train stations are becoming the meeting places for eco-minded commuters concerned about the health of our planet. Meet Princeton, a 32-year-old Thoroughbred Arabian cross gelding that has spent the last 16 years helping the disabled in Northeast Ohio. Recently awarded the 2007 National Therapy Horse-of-the-Year award, Princeton hangs his saddle at Fieldstone Farm, a nonprofit organization that provides equine programs for people with cognitive, social and/or physical disabilities. Princeton spends his days dutifully serving his students and all he hopes for in return is a pail of carrots. Through classes with horses like Princeton, students improve their physical and social skills, increase their self-confidence, and develop profound connections with the gentle animals. Like Princeton's capacity to graciously help others, RTA is dedicated to community service. 2007 revealed the transit authority's involvement in a number of outreach efforts, including improvements to Paratransit - a transportation service that utilizes specially trained operators and lift-equipped buses to ensure all citizens are able to reach their destinations. Last year, RTA approved and implemented functional testing for Paratransit applicants. The new process allows RTA to evaluate the abilities of prospective customers in order to more effectively allocate resources. Functional testing is already successfully used in other major cities. Other improvements made to Paratransit in 2007 include the purchase of 20 new vehicles, the development of call center procedures, and the hiring of a scheduling manager, all contributing to a 66 percent reduction in wait time. The transit authority's outreach efforts in 2007 also included a specially-outfitted community bus. It was taken to schools throughout Northeast Ohio to teach students how to safely ride buses and trains. The curriculum included a safety video developed in a language consistent with the Hanna Montana generation. While kids were on summer break, families came together to celebrate at a number of RTA-hosted activities. They included Family Fest at the Zoo, and Family Fest in the Flats for the 4th of July. RTA also supported Walk-Roll Cleveland and EarthFest, in an effort to make Clevelanders and the planet healthier. In addition to saving commuters money, RTA helped save lives by holding its annual blood drive. The drive is held after Labor Day, a time when the blood supply becomes critically low. Last year, donors came from all parts of downtown, taking the Trolleys to RTA's Main Office to donate blood. Listening to the community has made RTA responsive. And for many years, the authority's most receptive ears have been the Citizens Advisory Board. This group continued its good work in 2007, providing feedback on everything from the transit waiting environment to routes and schedules. Whether by saddle or seatbelt, both Princeton and RTA are doing their part to serve the people of Northeast Ohio, with no thanks necessary. Unless, of course, gratitude comes in the form of a bucket of carrots. Since 1995, the search for the nation's best heart care has led people to the Cleveland Clinic's Heart and Vascular Institute. How do they hold the title as Number #1 for cardiac care for 13 consecutive years? Through a commitment to innovation, better outcomes and improved quality of life for patients. Attending to more than 234,000 patients each year, the Heart and Vascular Institute will soon have a new home in the impressive one million square foot Sydell and Arnold Miller Family Pavilion now under construction on Euclid Avenue. It's fitting that the new Heart Institute is located along Euclid Avenue, since Euclid is the main "artery" RTA is using to pump life into Cleveland. The Euclid Corridor project, which will transport riders from Public Square to East Cleveland in just 28 minutes, made great progress in 2007 and is on track to open October 25th, 2008. Despite unexpected delays due to structural repairs from Public Square to East 9th Street, RTA surged ahead with road construction in 2007. By the end of the year all quadrants of Public Square and both the north and south lanes from East 17th Street to East 86th Street were completed and opened to traffic. In June, the E. 40th stop, located in the corridor's median, received the honor of being the first station installation. The stainless steel and glass structure served as a symbol of good things to come for the corridor. And come they did. As the year went on, stations were installed all along the route - both median and curbside - complimented by attractive streetscapes with integrated artwork. With road construction complete and stations in place, the section from East 17th Street to East 55th Street became fully operational on Nov 26th. Passengers of the current #6 bus route can now familiarize themselves with boarding from the new station platforms, and Euclid Avenue drivers are becoming accustomed to the new traffic flow. 2007 also saw significant milestones for the project's state-of-the-art hybrid vehicle. The year kicked off with the 63-foot long Rapid Transit Vehicle (RTV) successfully completing the FTA testing for safety and performance. By year's end, the RTV headed into full production with 20 vehicles scheduled to be completed by early 2008. In addition to these infrastructure achievements, the Euclid Corridor is providing Cleveland with a massive transfusion of economic growth. Currently more than $4 billion in capital investment are being pumped into the rehabilitation of buildings and new construction along the avenue. It's also bringing in new business, including more than 30 new tech firms, that now call Euclid Avenue home. So while the pursuit for the best heart care may lead you to the Clinic, RTA aims to lead all of Cleveland down a path - make that "corridor" - of growth and prosperity. In this day and age, competition in the airline industry is fierce. In the fight to offer passengers the lowest fares, many airlines have begun to strip in-flight frills and amenities, such as complimentary meals and video on demand. Continental Airlines, however, has not followed suit. Instead, the U.S. carrier has made a commitment to modernizing its fleet and upgrading passenger comforts while maintaining its award-winning levels of cleanliness, safety, and reliability. As a result, business travelers have rejoiced, and in 2007 Continental Airlines was voted Best Airline for North American Travel by readers of Business Traveler Magazine. In its own way, RTA has been upgrading business travel for years - or at least since 1968, when RTA rolled out the "Red Line," North America's first rapid transit service to an international airport. In the time since, RTA has enhanced its relevance to business-minded commuters by introducing the Park-N-Ride service, where MCI Motor Coaches feature a few "in-flight frills" of their own. The high-back reclining seats, tray table workspaces, and individual passenger lighting enable riders to kick back or get a head start on the busy day ahead. RTA provides business-class accommodations at an economy fare. Case in point: The Commuter Advantage program, which now boasts 387 participating employers and more than 9,300 employees. By making it possible for these commuters to purchase transit fare using pre-tax dollars, employees are able to save a few bucks while avoiding all the hassles of commuting to work. Over the years, RTA has become an increasingly hassle-free mode of transportation. In 2007, the system logged an average of 6,260 miles between service interruptions and recorded an on-time performance rate of nearly 80 percent - numbers that make even the finest in air travel envious. And even on those rare occasions when RTA is running late, NextConnect digital signage provides riders with real-time updates on the status of their bus or train, in addition to the final score of last night's game. Ultimately, though business travelers are an important focus for RTA, the system's relevance expands well beyond the morning commute. Over the years, RTA has literally evolved into one of Cleveland's most trusted travel authorities, offering services specifically tailored to the arts and entertainment needs of the community. Just this past year, in fact, RTA issued a series of brochures encouraging visitors and Clevelanders alike to explore local neighborhoods via RTA, armed only with an All-Day Pass, a few extra bucks, and an appetite for adventure. Whether you hail from Cleveland or you're just visiting, traveling for business or pleasure, RTA offers a clean, safe, and reliable service just for you. And, as far as passenger comforts go, not even the "Best Airline for North American Travel" can compete with the legroom. RTA completed 2007 in a solid financial position despite continuing challenges caused by rising energy costs and falling revenue sources. This was accomplished through the combination of a stronger beginning balance and a tight control of expenditures, producing an ending balance that was $10.3 million higher than budget. Sales Tax Revenue was $1.2 million below projection. The weak performance continues a seven-year trend caused by slow economic growth in the region. Unfortunately, this trend is projected to continue in the near term. Operating Revenues exceeded the budget in some categories while falling short in others. In total, revenue increased 2.7 percent, to $6.8 million. In spite of that, however, revenue fell short of budgeted estimates by more than $3.5 million by year end. Passenger Fares increased by 7.1 percent, but was under budget by about $2.1 million. Similarly, Sales Tax increased by 1.8 percent, but fell short of budget by $1.2 million. These two sources of revenue provide about 85 percent of the Authority's funds. Operating Expenses, led by surging fuel costs, continued to cloud the financial picture last year. However, early proactive action taken by RTA to control operating costs helped to offset spikes in diesel fuel. Healthcare costs, labor costs, natural gas and utilities all were under budget, and improved the year-end balance to $14.0 million. This careful monitoring of expenditures allowed for a positive ending balance. Capital Expenditures remained relatively close to budgeted levels, as progress was made on the Capital Improvement Plan (CIP). However, some significant positive variances are noted as a number of projects have been delayed or completed under budget. Financial Indicators confirmed RTA's overall fiscal health. All eight indicators moved in the direction of established policy goals, and four of the eight met budget goals. Cost per Hour of Service ended below the inflation rate with a 1.9 percent increase. The improved ending balance allowed Debt Service Coverage to reach 1.8. This not only exceeded the budgeted level, but also met the Board policy. Sales Tax contributed 13 percent towards the Capital Plan, thus meeting the goal of a 10 - 15 percent contribution. At 12.1 percent, Overhead Cost to Total Cost was below the goal of 15 percent. A stronger ending balance also put RTA's Operating Reserve at 0.7 months, significantly better than the budgeted level of 0.2 month, though still not enough to meet the Board goal. Furthermore, with the additional revenue from the fare increase, improvements were noted in the Operating Ratio and Fare Subsidy, though neither policy goals were met. It is important to note that the financial scenarioat the end of the year demonstrates continued improvement in controllable areas. Departments throughout the Authority worked in concert to produce positive outcomes. An action plan was developed early in the year to identify the economic issues and address any threats to the financial well being of the Authority. The staff of the Office of Management & Budget worked with all in the Authority to closely monitor expenditures and revenues throughout the year. The end result was a $10.3 million improvement over the budgeted amount in the year-end balance.